When Your Homeschool Day Doesn’t Go As Planned…. 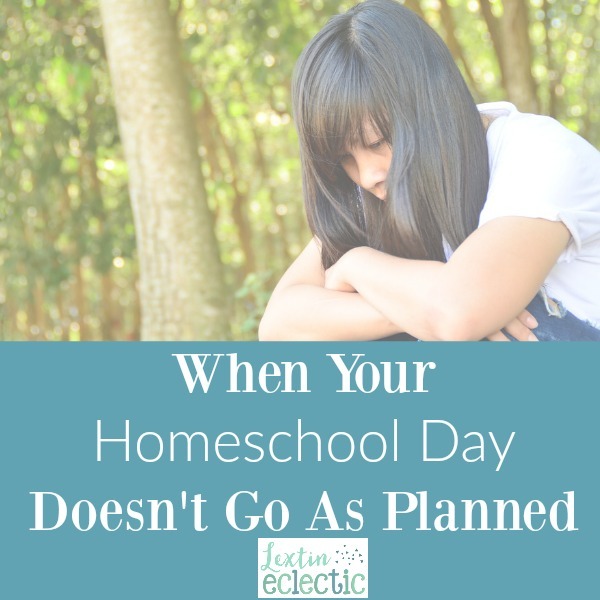 What can you do when your homeschool day doesn’t go as planned? You could throw a fit, put on a movie, and then go hide out in the pantry eating chocolate chips. Oops, so sorry! This is supposed to be advice for what you should do…..not what actually happens around our homeschool. See I’m a planner and I’m organized and I’m very Type A. I hate nothing more than chaos, disorganization, and plans gone awry. So, what should you do when your day doesn’t go as planned? What if you’re like me and the words flexible, adapt, change, spontaneous, or patience are not anywhere in your vocabulary or even in any dictionary you own? Here’s what you really should do……..
Pray now. Pray before the crazy cuts loose and you are losing your mind. Because no matter how great today might be, tomorrow is another day and it might catch you by surprise. So, know that disaster might be around the corner and be in prayer through the good times so you’re prepared in the tough times. Be in the Word right now. Why? See the reason above. Store up Scripture in your heart so that those helpful verses pop up in your mind the minute you start to fall apart. Be prepared for that day when nothing goes as planned and you need a Scripture pick-me-up. There is nothing worse than being off schedule or “behind” in those lesson plans if you are a planner. Sometimes it is best for everyone to take a break from school or from each other. I’ve implemented movie times; stay-in-the-backyard-and-don’t-come-in times; and do not play together, speak to each other, or look at each other times. I’ve found that I have to give myself grace when trying to keep up with a demanding schedule. Down time is important. Ohh this is drastic! For some of us, it’s better to plan only one day at a time or better yet, write a journal of what we did each day rather than plan our days in advance. It’s encouraging to go back and read through a week of progress rather than all the erased and crossed-out lesson plans that had to be changed at the last minute. Force yourself to be flexible. Sometimes I look for ways to step out and be flexible. It’s just a little practice on days when things are going fairly well so that I’m prepared when they days are terrible. I can switch the times we do things and I can change our schedule. I can make time to be with friends or take an impromptu field trip. Then when my day falls apart I remember that I have been flexible before and that I can and will do it again. These can be in the form of homeschool mom friends. I have friends that I can call to hang out or just to chat. They know the challenges of homeschooling first hand and can empathize with me and encourage me. It’s good to know I’m not alone. I can also call on my spouse. He supports our homeschool endeavor and is involved in as many ways as he can be. When I have one of those days he lends a listening ear, prays with me and for me, and is always ready and willing to step in and give me a much-needed break either with the kids or in the house work. I’m so thankful for homeschool support. Give yourself and your children grace. Know that your homeschool venture will have some rough patches and rocky spots. You will fail and your children will come up short. Be prepared to give yourself grace and extend grace to your children in those moments. When you’re prepared for days that are far from perfect, you can handle the disappointment and the discouragement that comes because you are able to forgive both your kids and yourself for falling short of expectations. These are a few things that have helped me cope when I have disastrous homeschool days. I’m still working on having the right attitude and response when the days are long and difficult. I can’t say that I always do a very good job. I might just have a long way to go in this department. I have a few (or more than a few) things to work on. Who’s right there with me? Great advice! The other day I sang all of my responses to the kids like we were in a musical. It was the only way I could make it through without losing all my patience. They quickly joined in! So we didn't yell – we sang. It helped change the atmosphere quickly! I thought I was the only one who sometimes gives up trying to plan ahead and instead writes down what we did, after the fact. It feels like more has been accomplished this way! This is so me! I am a planner..and I have learned since I started homeschooling that I had better write my plans in pencil. This was really hard for me at first, but I have gotten better at it! hard days mean altered plans. Hard days mean taking a step back and saying… what needs to be different here today in this house with these people. Altering plans isn't a bad thing. No, altering plans is not a bad thing – but it can be super challenging! I'm still working on it!